How can airport furniture make flying more comfortable and enjoyable for all passengers? I've been fascinated by air travel and airplanes since a young age, but I've always been frustrated by the reputation that precedes air travel. When you talk about airport experiences, passengers often tell you about long delays, anxiety, and incredible boredom. With Keit, I wanted to explore how design can help make travel more comfortable by rethinking passenger waiting area furniture. I recalled Brian Eno's ambient album, Music for Airports, a product specifically designed for the space. Eno began composing the album after a flight from Frankfurt's airport, where he recalls a beautiful sunrise over the airfield, accompanied by canned pop music. He felt the terminal required its own soundtrack, and set out to create the world's first ambient album, with the intention that the music should be "as ignorable as it is interesting" (see the whole interview here). I took this viewpoint as inspiration, and set off to create furniture that meets passengers' needs, while integrating itself seamlessly into their journey. Airports are distancing themselves from airline revenue in search of more stable and lucrative passenger revenue. What they’ve found is that happier travelers=happier shoppers. Airports are encouraged to provide a better customer experience in order to increase passenger revenue. 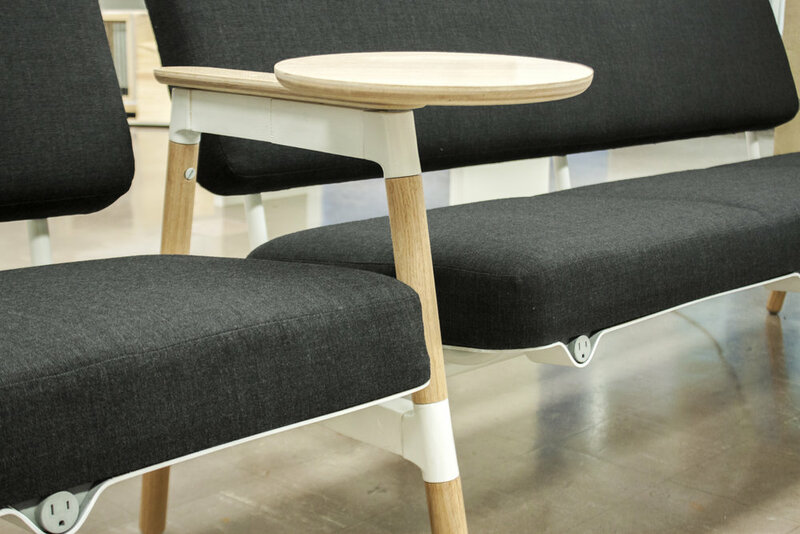 Now is a great time to provide innovative furniture to airports. Waiting room furniture has changed very little in the past century. Now, passengers find themselves waiting longer hours for more reasons than ever before. New airport furniutre must be as versatile as the passengers – accommodating their needs without getting in the way. As a result of airports diversifying, they are becoming more experience-focused. Take, for example, the wave pool at Munich International Airport. Designed to draw both travelers and city-dwellers alike, the airport is looking to become less of a processor of people and more of a civic institution, where passengers are encouraged to spend time, relax, and spend money! Integrated power and room for three. The couch aims to serve families and indicates to passengers traveling alone that this space is for groups. Integrated power and a clear indication of whose space is whose. 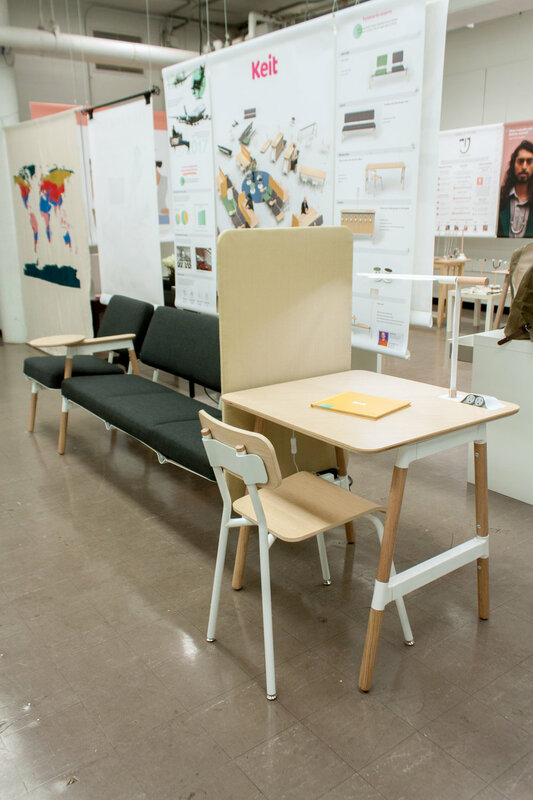 Integrated power, task seating with room to spread out, integrated lighting. It's ok to have fun! The wobble stool provides seating for both kids and adults looking to burn some energy. Lockers allow passengers to leave their bags and roam the terminal freely. The lockers are inside the TSA secured area and open with the scan of a boarding pass. Integrated lighting makes the system feel more residential and cosy in the airport. Privacy shields, endcap seating, and tables make smart use of space and attach using the rail system. For DAAPworks 2017, I created a full scale, sit-able model of three of the modules – the worksurface, the single seat, and the couch.